As part of a series to explore the famous roads of cycling, here is the Col du Lautaret in the French Alps. The idea with this series is to discover the road and its place in the world, whether in cycling’s folklore or to explore what it is like on a normal day without a race. The 2014 Tour de France route was unveiled and Stage 14 looks to like the Queen Stage, it’s certainly got alpine aristocracy with the climbs of the Lautaret before the Izoard and the final climb to Risoul. The Lautaret is a long climb by itself but also one of two ways to reach the start of the mighty Col du Galibier. It’s a climb that’s perfect for the Tour de France but unpleasant for others. A road not to ride? The D1091 runs east-west between Le Bourg d’Oisans and Briançon. Click on the map above to enlarge it but note the red artery passing through the white terrain of the high mountains. This piece will cover the western side, the direction to be taken by the Tour but both sides are similar. It’s 34km long at an average of 3.8% but the low rate is not to be dismissed, there are two small descents and the distance takes its toll as the road rises to 2058 metres above sea level. The climb is steepest at the start the road gains height above the Romanche river, some wide hairpins and two tunnels along a cliff-hugging road that arrives at the vast dam of the Barrage du Chambon which is used as a bridge by the road to cross to the north side of the valley. At this point there are turnings on the right for the Les Deux Alpes climb on the right and soon after the Col de Sarenne on the left, both famous from the Tour. The the roads tracks the white waters of the Romanche upstream, climbing higher to pass through the ski town of La Grave and on towards the summit… which is where mighty Col du Galibier begins. After a flat approach the road rises so suddenly you can draw a line to mark the exact start of the climb. You change gear with both hands. The scenery is great as the road winds up the narrow valley but on a hot day the rocks radiate heat back at you. You can see the hydroelectric dams below and how the narrow valley lends itself to these buildings. 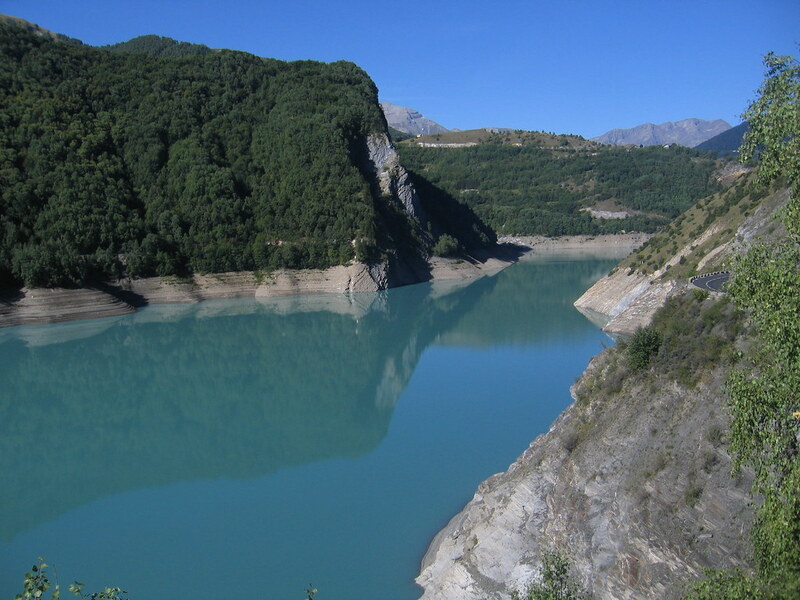 Often the reservoirs are blue, a result of oxygenation and minerals in the water. But now comes the contrast. For the scenery is spoilt by the traffic. Enter the first tunnel and if it’s illuminated by a bright orange sodium glow, the acoustics make a small Renault sound like truck bearing down on you. It’s hard not to feel the shoulders tense up as the Doppler effect does its thing. After you cross the Chambon dam the valley begins to open up. Onwards and upwards and the road is still busy, two or more cyclists will find they have to ride single file for much of the way. There are some cols that you can do without seeing any traffic, there are others that have cars but many drivers know they’re on a road that’s special for cycling. But the Lautaret seems to belong to truck drivers. There are more tunnels to La Grave and these are not so well lit. La Grave is a small town, look for the fountain if you want to top up your bottles. The further you go the better it gets as the valley opens up, there are views of glaciers and the peaks of the vast Ecrins range including La Meije. 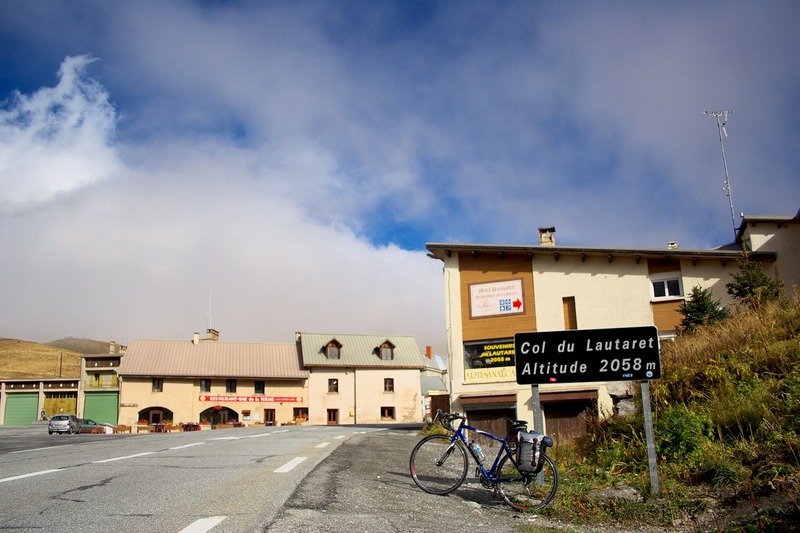 Play word association and Lautaret should be linked to col, Tour and… tailwind. Someone else can explain the meteorological phenomenon but when the sun is shining warm air seems to rise up the valley boosting the rider as they climb this side, a welcome help given the gradient is not so steep. Note the top is kite-ski destination in winter. Arriving at the top is a bit of an anti-climax as you see the sign for the Col du Galibier. All this way and yet you’re not really at the top and to ignore the Galibier is to miss out on one of the sport’s greatest roads, at least by reputation. But by now the legs are heavy and a fast descent rather than a steep climb is temptation defined. Plus the mind might not be uplifted by the top of the pass itself which is a few jumbled buildings with several large concrete garages that probably house tractors and snow ploughs and look redundant in the summer. If you’re the type that rides up whilst friends and family go by car there is a garden full of high altitude plants to be visited. This is a highway, a red artery on the Michelin maps and a route that connects Grenoble to Briançon and on to Italy. It might go beyond 2000m above sea level but it’s a toll-free route so it drains some of the traffic. The Tour’s riders don’t know how lucky they to have closed roads because every other day of the year there are trucks, fumes and more. It’s nominally open all year round but the cyclist should only consider May to October, it might be open but the road can be icy and requires snow tires or chains. First used in 1911, it’s been climbed 29 times but sparingly in recent years. It was crossed in 1976 but again until 2003, perhaps because closing the road for a day is a big ask, even for the Tour. It’s often used as access for the Galibier whose other side is ascended via the Col du Télégraphe. Racing up is very different to a normal day as it means closed roads and no time to enjoy the scenery. It’s often been the first climb of the day and as the attacks fly and the familiar tailwind blows riders are doing in excess of 40km/h uphill, fatal for anyone on a bad day or nursing a weakness. Having not been entirely complimentary about Alpe d’Huez because of its traffic and functional style, the Lautaret is far worse. Bourg d’Oisans makes a useful base with a range of family-run hotels and there are many good roads to ride in the area. Many will climb the Lautaret on their way to the Galibier and there’s the Col de Sarenne and another route up to the Alpe via the village of Villard-Reculas. 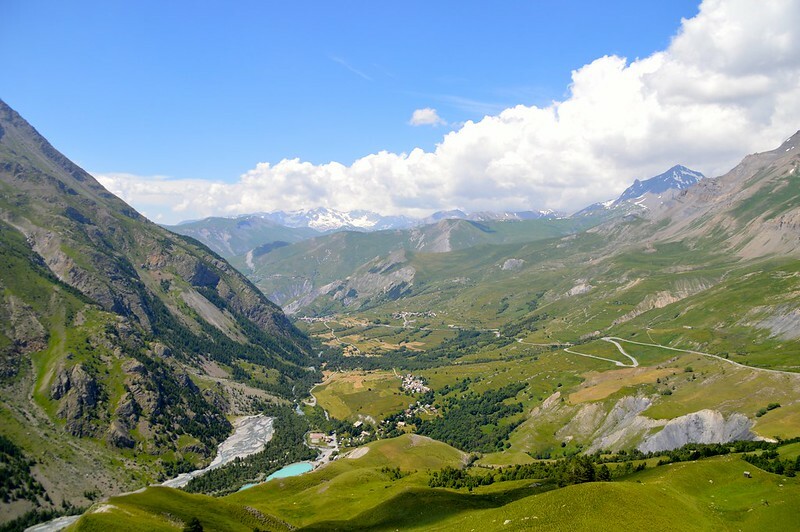 There are also many other cols in the area that have been used by the Tour de France like the Glandon and Croix de Fer sisters, all of which tend to be open from May until October. If the Galibier is the roof of the Tour de France then the Lautaret is its fire escape rear staircase. You’re better off ascending the Galibier via the more tranquil Télégraphe. In isolation it’s worth riding to say you’ve done it. You’ll never be lonely on this climb given the traffic, it must have been a great climb to ride 50 years ago. But the scenery is timeless and it is more rewarding the higher you go. But visit the region and the Lautaret probably won’t be the highlight. Next week, the highest col in Italy you’ve never heard of: Nivolet. Given the invitaton I could not resist. The technical name is anabatic wind. It starts with the sun heating the ground and part of this heat being transferred to the air. On the plains the heated air rises vertically forming thermals, identifiable by the birds that circle in them to gain height and by the fluffy clouds that sometimes form above them. In the mountains the heated air tends to cling to the slopes while it climbs, to be released along the ridge line. It gives a helping hand to cyclists but is a real treat to gliders and hang gliders. Runs of many hundreds of kilometers per day can be easily made, powered solely by this type of lift. I have ridden this col on four occasions and not found the traffic bad at all, but this may have been due to the fact that they were all cyclosportives (including the Etape, which of course has closed roads). What I did find, contrary to INRNG, was headwinds rather than tailwinds. Is it possible that in the afternoons cold air from higher up pushes down the slopes? This was particularly noticeable during the 2005 Serre-Che Luc Alphand cyclosportive when the race route ended up going over both sides of the Lautaret. I swear there was an uphill headwind in both directions. Your take on this “climb” is dead-on. Sadly more of a “road not to ride” unless you must in order to access more peaceful ascents. Worse, the DESCENT into Briancon is not worth the effort of the climb, one of my key ingredients for enjoyment. Years ago there was a rickety hotel up there, a real firetrap, though the guy who ran it was an interesting and friendly character. Not surprisingly, it burnt down but I believe the adjacent restaurant is still operated by his children. Worth a stop, as they sell some excellent mountain cheeses up there! Ah the Galibier … from the Telegraphe it is pain defined! 🙂 Relentless climbing and the damn grade marker signs that appear every kilometer … just when the air runs out at 2300m it goes from single digits to double digits. Nothing feels better than no air, steeper melting tar roads being ridden through snow banks. A day I will never forget. Inrng you are our hero! Thanks for the this juice slice of France. I’ve ridden the Lautaret on a motorbike a few times now, and it’s rained every time. A tailwind isn’t so important with 150bhp, the lorries, and the rest of the traffic just gets in the way. Don’t knock this road , done it many times and there is always plenty to watch as you chug along . Definitely the best way to ride up the Galibier , in fact there have been times i have hopped over the Avalanche barrier to go up a few more kilometres during the winter months . Having friends in Les 2Alpes , i have had the time to ride to Briancon & Gallibier same day , Col de Sarenne & L’Alpe d’Huez another . Those in Oz would be amazed to see several of the blue 1 1/2M signs along the route as well as the Km signs with gradient % to encourage the effort . Lots of touring bikes use this route to visit Italy , though i am happy they are the ones using granny gears . It’s better on the way down, even with that hot headwind. I’ve only crossed the road by car, from the opposite direction (Briancon-Lautaret-Bourg d’Oisans). I don’t remember many trucks, but the traffic was important and the tunnels without lighting (except the one mentioned; though it was 9 yrs ago, now). The other point I agree, too, was the views. Maybe in Galibier is better, but that doesn’t mean the Lautaret isn’t worth a visit for the views. I visited this area in July this year. The scenery descending to Bourg d ‘Oisans is spectacular however it’s not a road i’d go out of my way to ride, more a means to an end- Galibier. If you want something truly remote try the Col du Sabot- it’s a gem and definitely worth a review. It isn’t high on the “epicness” scale but it does have some incredible views off to the right on its upper slopes as you climb from Bourg. Also, descending on that same side is fast and wide open. Not too shabby. Some of the the tunnels at the bottom are shocking though – would it harm them to put some lights in them? While it won’t win a Michelin star anytime soon I will never forget the spaghetti bolognese that I had the restaurant at the top opposite the junction with the turn-off to the Galibier. After having ridden up the Galibier from Bourg the weather turned nasty for my descent back down via the Lautaret. The coldest I have ever been on the bike. Had to pull in to the restaurant to warm up. That pasta was like finding a glass of iced water in the desert. Coincidentally, some friends of mine had a similar experience there with the weather and they were greated by the owners with warm blankets as they pulled up outside! Only seems pedestrian when compared to the heavyweights nearby. It would be my favourite climb if it was in my backyard. I recommend turning right just before the climb starts after the long straight section out of Bourg. It takes you on the D530 to La Berarde which is a dead end but the scenery is amazing and one of the best rides I have done in the area. If you want somewhere to stay in the area then can highly recommend Vaujany, the climb up is a killer after a day on the bike. Beautiful place, but for me, Col du Lautaret from Bourg is the worst +2000m climb in France. 10 tunnels, several long, dark, wet, and narrow. And always plenty of traffic including trucks. A nightmare if ascending. Of course very popular among Tour groups that stay in Bourg and want to climg Alpe and Galibier.